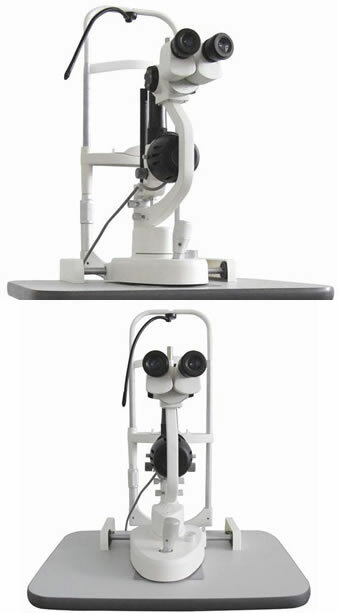 The Galilean-type Slit Lamp Viewlight CSL-2U magnification system provides the 10X, 16X and 25X three magnification (standard configuration) and 6X, 10X, 16X, 25X and 40X (professional configuration); there is no need to change the eyepieces. The CCD adaptor, digital camera and teaching tube are supported. It can provide 0.5mm, 3.5mm, 8mm and 14mm (max) apertures; it is specially fit for the examination for contact lens and foreign body in cornea.. The German imported Osram 12V30W halogen lamp and LED lamp are both available. The slit angle of the Slit Lamp Viewlight CSL-2Ucan turn over 180 degree, horizontal scanning is supported. Are you done with the Slit Lamp Viewlight CSL-2U? Go to Slit Lamp.